• The Center for Disease Control (CDC) affirms, "Keeping hands clean is one of the most important steps we can take to avoid getting sick and spreading germs to others." • The Occupational Safety and Health Act (OSHA) require employers to provide adequate washing facilities for employees that work with contaminants that may be harmful. • The Association for Professionals in Infection Control and Epidemiology (APCI) position, "Although people usually think that germs are spread through the air, the fact is that germs are most easily spread through HAND CONTACT." AND "One of the best ways to avoid getting sick or spreading illness is to wash OR to decontaminate your hands." • The Center for Construction Research and Training (CPWR) states, "Lack of cleaning facilities on construction job sites increases the likelihood of dermatitis, caustic burns from extended contact with wet cement, or acid burns from muriatic acid or other hazardous agents that come in contact with the skin, and infection." The result, additional workers' compensation claims. • The Center for Disease Control (CDC) estimates that 36,000 people die from the flu or flu-like illness each year, and another 5,000 people die from food borne illness each year. And your best protection from this type of illness is frequent hand washing. 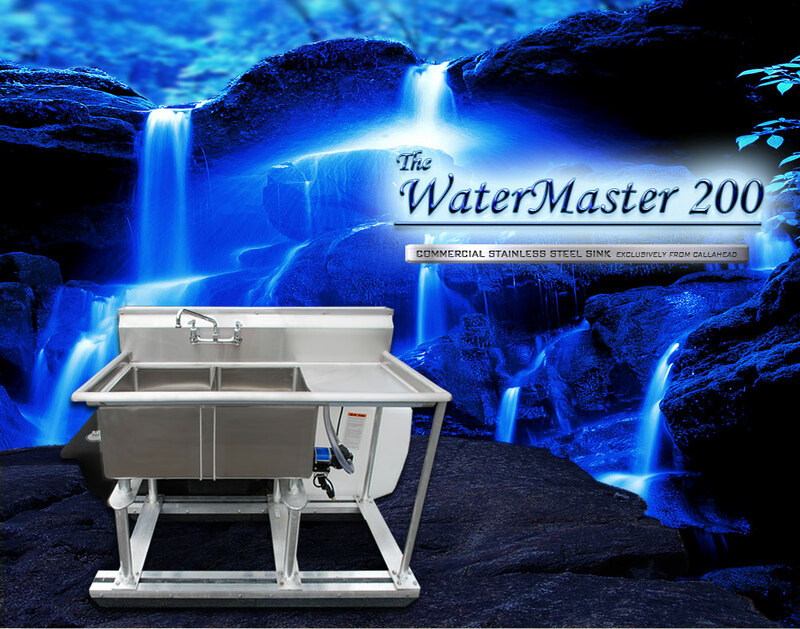 The WATERMASTER 200 is outfitted with double stainless steel sink compartments. CALLAHEAD created this commercial sink for outdoor special events such as food markets, festivals, carnivals, fairs, feasts or other private or public events where food is either being served or prepared for safety from germs and bacteria. Also ideal for construction job sites with the durability to handle the heavy duty cleaning of wet cement, solvents and other hazardous agents from hands, tools and mechanical parts. The WATERMASTER 200 has two stainless steel sinks, a work shelf and drain board to give you a complete commercial grade working station to handle multiple cleaning and drying jobs at once. Users will not be able to tell the difference between an indoor commercial sink and CALLAHEAD's WATERMASTER 200. Designed for special events and job sites to be health code compliant and sanitary, this stainless steel sink is easily cleaned and disinfected for added protection. 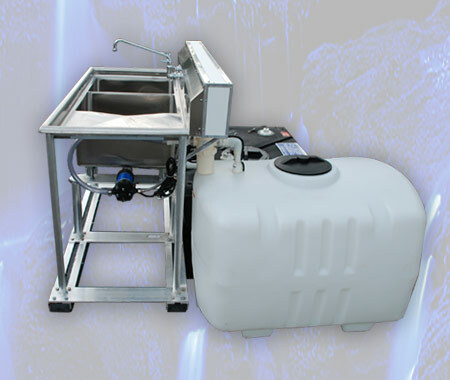 The CALLAHEAD designed PORTABLE WATER AND SEWER SYSTEM completes the WATERMASTER 200 which provides 100 gallons of fresh water so no sewer connection is required. Our 115 gallon waste water tank is a completely separate tank so there is never any worry of grey water contamination. Available with our optional BOSCH HOT WATER HEATER so any location or event can have hot running water. The WATERMASTER 200 has all the resources required of a commercial quality sink and is only available from CALLAHEAD.